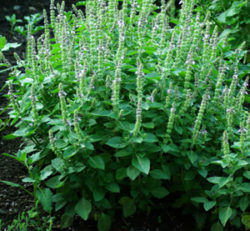 (Vana Tulsi, Clove Basil, African Basil, Vantulasi, Wild Holy Basil, Tree Basil) Perennial bush basil to 5 feet, native to India and East Africa, a wild species brought into cultivation. 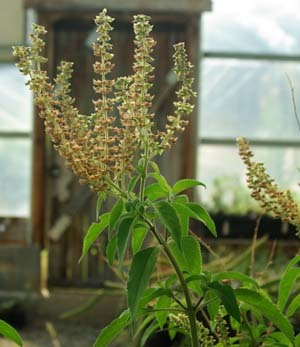 The plants are woody-stemmed and actually overwinter indoors more readily than the other tulsi types. I have brought them successfully through a winter in gallon pots on an indoor windowsill. 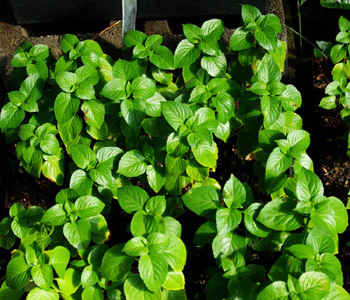 If you do this, they can be transplanted outdoors after frost and they grow fast! Source of eugenol (oil of clove). The plant is handsome and aromatic, slightly hairy, green-leaved. 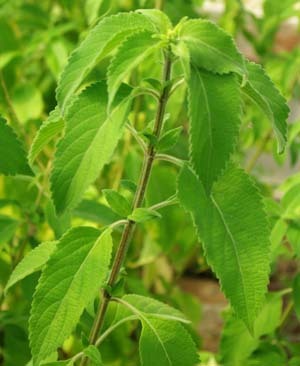 As a garden grown tea herb, it weighs up heavily and may be used by itself or blended with leaves of other types of tulsi. Traditional usage (Ayurveda): stress, anxiety, heart disease, arthritis, diabetes, and dementia. Drinking tulsi tea in the morning is a fantastic way to get started. Space plants 2 to 3 feet apart. How much cold can this tulsi take? Could it overwinter in a small greenhouse in zone 9b (which is tending ever-closer to zone 10 as the climate continues to warm — we no longer have any frosts here). The temp in the greenhouse never falls below 40 degrees F but I’m not sure if that will be warm enough. Thanks for any advice you can give me on this. What size pots are these plants grown in? I would like to place an order but, i want to know the size of the plant containers before I purchase them. 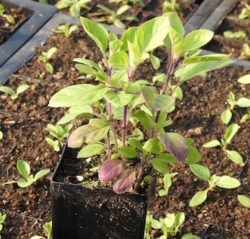 The Vana tulsi were started last year in the fall and have grown significantly. They are in our standard 3 inch pots.